Another old mani, F21 mood polish - shimmery purple to pink. These polishes are similar to the Claire's polishes I saw, but I ended up buying them from Forever21 because of the bottle. The color shifts from purple to pink, pink being warm and purple being cold. This works well when your nails are long, so it looks like you have a funky french, since the tips end up being a different color. This is the only shimmery one, the rest are neon cremes. I like this color the best because the shimmer just looks so nice, almost suede. 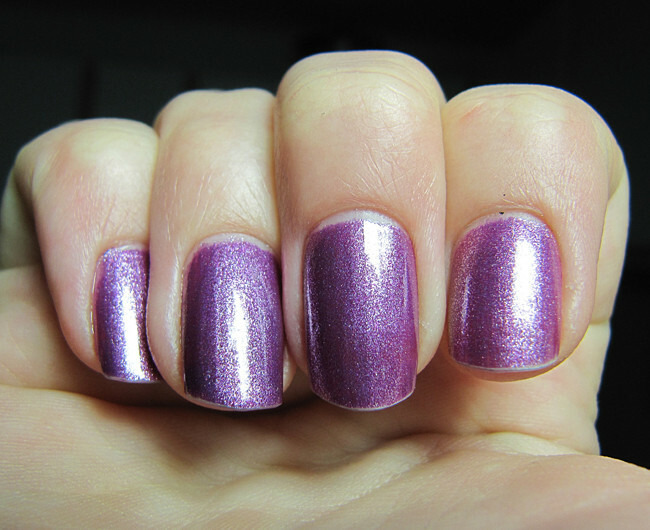 The color shift on the purple is a lot more dramatic compared to the other polishes as well. Color changing polishes are fun, I can't wait to find some of the crazier ones! F21 has a surprising amount of neat nail polish! I also like their green flakie and gold hex glitter!